As communicated earlier, we are pleased to announce the availability of a new Advanced Plan for Push Notification Service on IBM Cloud. The charges are 100$ per month per instance, which includes 100 million digital messages and 1 million addressable devices per month. 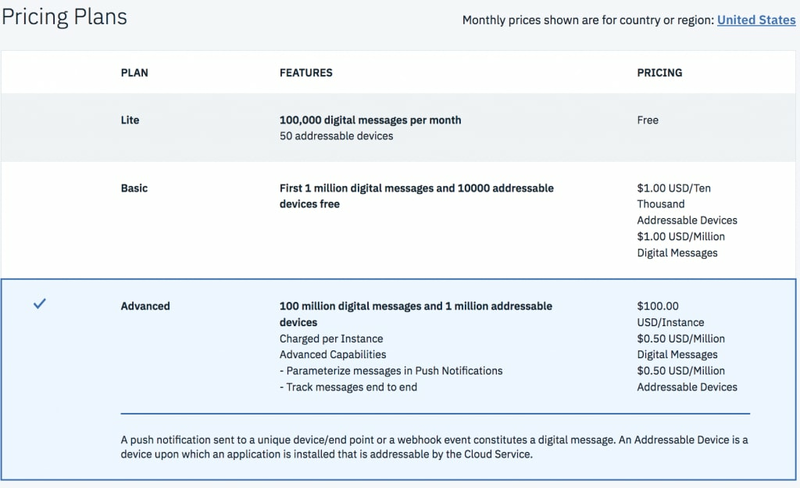 $0.5 would be chargeable for every additional million digital messages and $0.5 for every additional million addressable devices. Have you wondered if the messages you sent from the push notification service did make it to the end user’s device? Did the user actually open the message? You can now track the delivery status for each digital message sent [Accepted, Processing, Dispatching, Dispatched]. You can monitor the receipt of the message per platform (mobile/web) and per user/device . This open’s up a whole new possibilities for your business. For example, you are a utility provider and its absolutely critical for you know if the end user has received the bill payment notification and has opened it. The video below has the details. Do you leverage the broadcast notification capability of the service, but still wish you could personalize each message. For example, a bill payment message needs to be sent to all users, but the name and bill amount needs to be personalized. Include dynamic and static elements in your push messages,while retaining the flexibility to replace elements once sent. You can now leverage the broadcast capability, but personalize each message. The video below has the details.